Market Sentiment Watch: Data deluge continues and this morning Chinese PMI coming in ahead of expectations along with a late vote by the House in favor of further restrictions on Iranian crude exports (see Commodities Watch below) have futures moving higher early. In today's post please find comments on earnings reports from two owned names and over half a dozen names we watch as well as the oil inventory review of yesterday's weekly data (pretty neutral), the natural gas inventory preview, and the natural gas production (flat with last month and up only 1.2% YoY), imports (net imports hit a new as exports to Mexico tied the old higher, LNG imports remain a trickle, and volumes coming down from Canada dwindled further), and demand (second highest May on record) slide shows for the month of May. Enjoy. We get nonfarm payrolls, unemployment and factory orders tomorrow. Crude oil rebounded $1.95 to close at $105.03 yesterday after EIA reported a neutral looking report. The move in oil came with comments by the Fed that saw a moderation in the Fed's view of the economy which people took as a signal to worry less about the taper. See Review section below. This morning crude is trading up $1.75 on China and the U.S. government. Iran Watch: U.S. House passes more sanctions designed to further slash oil exports from the country. The bill looks to cut Iran's exports by 1 mm bopd over the course of the next year. Who needs a Cartel when the US government is looking out for oil prices? Natural gas added a penny yesterday to close at $3.45 another day of light trading. Please see the supply and demand comments and graphs below. This morning gas is trading flat. Production - flat from April levels, up 0.8 Bcfgpd or 1.2% from May 2012. "Other States" represents nearly all of the growth. Imports - fell to a new low, just under 3 Bcfgpd. Included in the net figure are exports to Mexico which tied an old high, now at 1.95 Bcfgpd. Demand - Second highest level for May demand on record. Record industrial for the month, again. Street is at +55 Bcf for today's report. Guidance: Not mentioned on a company level but upped for Bakken exit and addition of new oil play below. this is one of the stealth plays they've been accumulating acreage in in. Expect 180,000 net acres to be prospective (claim based on vertical well control we're sure). Shooting 3D on 24,000 acres now and planning to more 2x the program for 2014. Costs down 10 to 20% due to pad drilling and simultaneous drilling and completion operations. Balance Sheet: Liquidity of $1.3 B, debt to cap of 24%. Other: PRB asset sale sounds unlikely at this time. Nutshell: In line results and what analyst doesn't like a new oil play? We own a start Core here and have been waiting on a market based opportunity to add. We may not get it soon. Results on the EPS line could drive an early dip from the knee jerk crowd but we like how this story continues to evolve and the reserve potential of the new oil play adds a second liquids rich arrow to theri quiver and we're likely to bolster this position soon. Guidance: Pretty much as expected, taking into account comments on the 1Q call and divestitures they move to a range of 30,000 to 34,000 for the year. Note that they have 34,000 to 36,000 for 3Q and current production is 35,000 BOEpd. EL Halcon (EFS) - slightly lower IPs this quarter due to landing the laterals in some wells partially out of zone. Look for them to talk about growth here on the call as well as cost savings. Utica - assuming full ethane recovery they announced an IP of 2,233 BOEpd (75% liquids) in Trumbull County, OH. This is obviously their best effort to date in the play and in the county to our knowledge and may serve to put to rest some of the analyst chatter regarding the HK's position in the northern Utica/ Point Pleasant play. Nutshell: HK answering critics with strong results. We don't expect a spike back to prior recent highs given the differnt path to growth that has emerged with the expansion of the balance sheet but our sense is that the name is overly beaten down at current levels. Volume guidance on the mid is slightly low to the current Street expectations of 33.6 MBOEpd but eyes should soon shift to 2014 plans and at about 5x TEV to 2014 EBITDA estimates our sense is the name starts to look too cheap as oily volumes mount from here. We continue to own the name in the ZLT as a top 10 position and a current levels can find room for additional trading positions. Slight increase in EBITDA guidance due to higher price expectations. Not a lot of numbers meat in their releases. Upped bottom end of range from 12% to 14%, top end stays at 16%. Midland County, TX Wolfcamp A with 24 hour IP of 1,712 BOEpd and 30 day rate 1,107 BOEpd (74% oil). Also noted a strong well in Martin County, a Wolfcamp B, there first in the county with a 30 day rate of 1,040 BOEpd. Good news for FANG, maybe LPI, AREX as well. Coiled tubing business hurt by trend towards larger diameter tubing ... aligning equipment to meet this shift. As usual, not much color in the press release. Drilled first Wilcox horizontal, had mechanical difficulties but a geological success. Nice beat (for EBITDA, not EPS) on better than expected, above guidance, volumes. 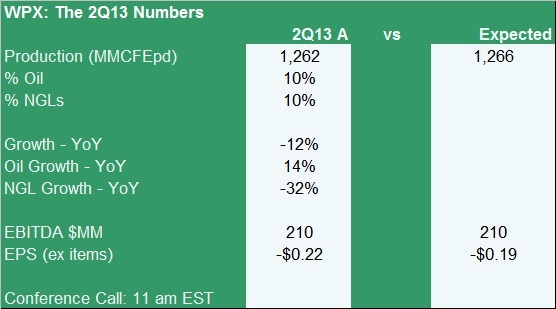 As usual, the press release is devoid of much in the way of operational color but good quarter on the numbers. 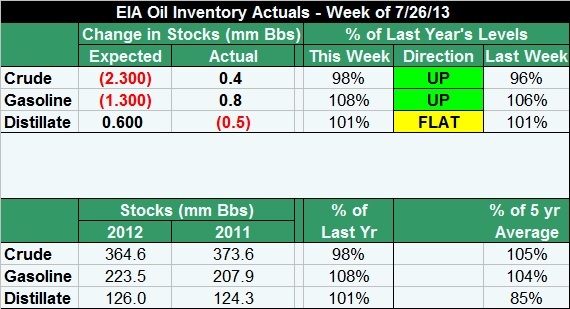 Utica - still listing in MMcfe's, good growth but dropping from 11 to 10 rigs soon. Tomorrow we get reports from KOG, UPL, and AREX. GST - Giving Cubic Energy a two week extension to August 30th to close the $46mm East Texas sale. This entry was posted on Thursday, August 1st, 2013 at 7:12 am	and is filed under hk, Natural Gas Supply, Uncategorized, wpx. You can follow any responses to this entry through the RSS 2.0 feed. You can leave a response, or trackback from your own site. Please share today's post, it's open to the public. Tap away on those little buttons directly above this comment. Zman, I saw a comment to a RBN Energy post about ZAZA and CWEI. Author of the comment was extremely bullish on CWEI growth. Have you looked at it or have an opinion? CHK Weekly Clearing long term volume base on good volume. re 2 – Yes but I have no current opinion. Listened to a conference call a couple of quarters back, came away kind of mixed. z — just a thought… i saw you posted a link to west's comments last night, but you might want to cut-and-paste into the comment section here today. West is an example of the incredible talent and information you have amassed into an investment-sharing group. "Visitors to the site" would benefit from reading his comments. I know I did. Notes….. Mkt continues to create acceptance higher. 1683 CHVN is current short term volume pivot. Mkt tested and rejected each lower CHVN as too low since Friday. All time highs and range expansion above 1694.50. Volume gaps below 1677.75 CHVN. Demand volume rolling over/flattening. POMO supportive through the end of August. Expect dips to be bought. Financials close to O/S bounce setup. Thoughts …….Long term uptrend intact. Strong acceptance around the 1683 CHVN. Short term upside bias above that level. 1670.75 Minor CHVN/Key pivot point in last weeks test lower. Z – wow big post. I will share. #7 – I saw West's post last night – great stuff. I have a cousin that lives in Midland – she says things are going vertical there in terms of people, business activity, trucks on the road etc. Z- have you looked at CPE at all? re 9 – yep, got asked awhile back by Wizard, didn't come away with positive enough thougts to buy it. $USD range bound with slight negative bias. Uncorrelated to nearly everything at the moment. Crude Oil Futs Demand volume picking up again. Rejected return to long term acceptance. Nat Gas Futs Below long term acceptance. Still short crude and long nat gas. HK – comment from Johnson Rice this am saying they like this report too. What fall under "simply amazing"- all the work Z put together between last night and first thing this morning. FCX- Jim Bob purchased 1,000,000 shares yesterday!!! Midland Tx = fastest growing city in USA. CWEI's last conf call: they have ~85,000 net acres in Del. Basin around Reeves cty which they are looking to JV as they have short leases. Plan A is to sell 1/4th, get carry to accelerate development, repay debt. They said do have a Plan B if no JV so they can still control acreage; West's comments make that sound smart, but also sounds like a JV is very possible. GHS was guessing JV could have a gross value of $800mm-$1B vs. cap of ~$700mm and EV of ~$1.4B. Clayton is 81. Will use proceeds to drill EFS. I own a small amount. CHK: When I mentioned the CC yesterday I was thinking of how many Aubrey calls I had been on. Would be curious as to what kind of grade you would give the new guy. REN also fancies itself as a reconstructed Permian co.which I hae trouble warming up to; same with CPE. 20 Aubrey's calls uped to be Can't Miss Them. Now I glance at the transcript when I get the time. When will cf and capex be balanced? A) Plan to get there for 2014, trying to get there on the top quartile metrics in 2014 as well. Talking about how the company has been grown from single well pads, talking about the benefits of going from a drill to hold to drill to develope way of life, helping with the reduction in capital. A) should be flat on balance due to the efficiencies – reduced cycle times on both drilling and completions … think of it as a flat year for well count. Q) balance sheet to improve via non core affiliates while cash flow meets capex? A) yes, balance sheet improves as they punt the weaker parts of the portfolio. Not sharing what's getting sold beyond what's been already noted. Q) top quartile metrics vs who? A) similiar sized peers – NAM centric big cap E&Ps. A) will be down slightly in the second half, less catch up needed on drilled but not completed well inventory and maybe a bit slower drilling pace in 2H13. Q) Comment on reducing complexity of the organization at CHK? A) Looking at all the affiliates they have to see if they are adding value. Timing should be ongoing process. Q) Utica performance – has it trended a little more gassy, still thinking to make exit rate? A) gassier since we entered the play, but nothing new from last quarter – the analyst noted they are quoting in MMCFE's as I did, they didn't give much of an answer on this. A) those options are out there but the focus now is on being as efficient as possible and to focus dollars on the best plays. PDCE – selling off a bit, have not gotten to look at their numbers yet. re 20 – Doug has a completely different tone from Aubrey and the analysts are putting a fresh face on it, I'd say people are generally pleased with what they are hearing on this call. LPI and FANG jumping on the PXD comments. HK opeing up 5% post numbers. Call starts in about 25 minutes. RMD – listen to the replay, not the transcript on this, if they didn't say Chesapeake occassionally you would not recognize this CC. NOV – Sold the (35) Nov August $72.50s for $0.62, on the mid and easily, with the stock at about $70.90. We are still mulling purchases in the name (of the common) in the ZLT but for for a 2 to 3 day trade (we added the second set of 30 calls on Tuesday at $0.23) we are pleased to be up 74%. OAS tapping new all time highs today. HK call starts in 10 minutes. SWN – attempting to break on out, earnings next week, more Brown Dense detail but not likely to get the thumbs up yet. 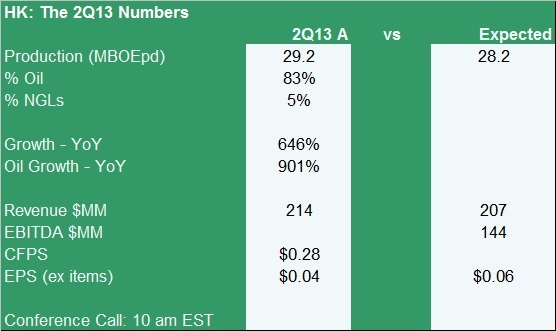 PXD up $20 … EOG could do same in this price environment with their earnings. ISM 'blowout' number at 55.4 vs 50.9 last month. ATW: Posted 6th consecutive earnings beat and market leading ROC of 12.1% (up 300 bps Y-Y). My hat is off to you Z for having this as one of your faves from 2 years ago. I did not like the small fleet but these guys have been very consistently good with their execution. I know you are not long but I can give you credit for the talented "gut" thinking. #30 – SWN earnings release is this afternoon with cc tomorrow morning. re 38 – thanks, slip of the keyboard. West–thanks for the post last night. Great read and helpful. Thanks, Z, for reposting it today. Looks like the Permian is really taking off. # 31: but PXD posted a $ 0.03 miss. Any take-out rumors? coals and even the dry bulks are looking green this am, WLT up ~5%, short some puts. re 41 – No, it's the Wolfcamp A and B results in those two counties noted in the post. XOP at 1 yr high, closing in on multi-year high set in 2011. SSN is still going crazy, 3x normal volume today already. I noticed I now have 93k ( yea I'm overweight and underwater) of SSWTS# warrants in my account. Does anyone know when these become transferable? – As we suspicioned after the last call, they are now adding to acreage around the first of their big Utica wells. A) We have a large area in 5 of the counties, north is gassier, south is oilier (nothing new here). In the area up beyond their wells to the north, not prospective. But called the area in Trumbull County, OH very largem, around this first 2,233 BOEpd IP well. Wells are $10 mm CWC now, will get them down to $8 mm once they get the science costs off the wells. Q) Landing zone in EFS being narrower? A) yes, so that comes out. A) Completing 3 wells now, doing fine, not a big focus for us, no more wells this year, nice play but doesn't have running room for us, it's a structural play … not exactly their shaley type repeatable success play. A) Well costs up a bit do to use of ceramic almost everywhere $10 mm in FBIR, $9 mm in Williams county, expect that to trend lower over the year. A) We don't disclose, we are adding acreage – have room for 500 wells at 160 acre spacing in the south part of the play. Next couple of years we will spend all of our capex in the area of the well announced today (Kibler area). You know the energy sector is en fuego when even little MHR is perky! FTK: another beneficiary of PXD results? re 48 = LOL, would say same but to an even higher degree with SSN doing what it's doing. Popeye – don't know, will see if can find out. BOP – can you check your email? Thx. re 50 – yeah, good association there. re 49 – yep, as per post, EPS miss causes some to punt plus that chart is weak and people eye the gap. I – like – what – see – there. Waiting on weakness to add more. KOG knocking on $10 door. Wakey wakey eggs and bakey … same kind of long rest period we gave OAS before writing the piece about the coming breakout for Oasis at the end of last year. Lynn has preannounced his 6th miss in a row … stock performance to hinge on current rate talk and the cubed spacing test he should have a dozen wells to talk about tomorrow from those two spacing tests … and should point again to the hockey stick in current production that will carry into a really strong exit vs the 2Q13 average. +59 Bcf – a bit high to estimates … need some summer weather. TMS – we have not lost interest whatsoever. We had some completion problems but very interested in the play … no more wells planned this year, plenty of the lease term. Have 90 to 100,000 acres there. REXX – break out in progress. I agree with West. PXD is my largest holding. The old Spraberry Play they pioneereed back in the day didn't make them a lot of money but did serve to HBP an extremelly large position in the Midland Basin that is worth a fortune. I spoke to an operator the other day that leased a fair amount of acreage in the Delaware Basin for Bone Springs/Avalon outside of the over-pressured window. They were dissapointed with the results but tried the Wolfcamp. After that well they stopped the marketing process and are very pleased with the results. Im my opinion it is the best of the Permian Plays. re 57 – I used to work with 2 executives from Parker& Parsley, up to the point of the Mesa merger, before it became PXD. Hard to get them to talk about much besides the Spraberry and in those days it was all a stacked pay vertical play. NFX – post quarter recovery in progress … it was a good operational update. Don't care about the post release sell off. WPX call in 20 minutes. OAS moving into all time new air over $43. Yippee Skippee. Thanks for sharing the link to the site today, trying to keep costs down and subscriptions the same price that they have been for the last 5 years. Added rigs (previously noted) to arrest declines in gas via drilling in the Piceance. Spud count up from 39 to 46 … adds the 2,000 bopd to exit rate as per post. This incrementally increases 2014 Bakken guidance by 8% … this is 8% over guidance that they have not given yet. very little of production guidance increase is due to increased capx, maybe 100boed. Will see that production in '14. As I remember, recent Canaccord initiation guessed '14 production up ~6.5%, which felt low to me. recent Ship Shoal well 'encouraging', this is a 2-5 year play for us so we are being careful, but start to see results over the next 12 months. just a solid story, solid mgt, call dull except that results so good and have the deep and hz's in front of them. WPX Calls – Added 30 August $20 Calls for $0.14 with the stock at that same level. Stock is focused on the EPS miss but missing out, at least in our view, on the oily growth that's underway and not giving them any credit for the new oil discovery here. A) We did have some capital and barrels in guidance with the SJB oil, so it was somewhat in there although it's much better than expected, saying Piceance better too, but hamped by some near term stuff in the Marcellus. Liquids percent will be up slightly so mid to high point of guidance, probably still 78% gas at the end of the … I've commented before that they have a great Bakken company buried in a gas company and he just said that they won't get much oilier because of the re-growth of gas from the Piceance. Working to get compression for the gathering system in the Marcellus. Would like to go back to 3 rigs in Susquehanna County, PA next year (vs 1 rig now). A) that intuitively makes sense to management, that it would be higher than 22% liqiuds, Said they would guide on the 4Q call or around year end 2013 for the 2014 volumes, costs, mix. Basically they are getting oilier but they are not going to spoon feed the analysts right now. HK now up 5%, improving post call. A) We are adding acreage, have plans to 4 wells this year, then 8 to 10 next year. Won't pull dollars from Bakken or Piceance (Niobrara) next year if they decide to the accelerating this new San Juan Basin oil program. ZComment sidebar watch: It's a rare day when a stealth oil play is announced with 4 successful, bigger than expected wells and people don't like it sooner or later due to an EPS miss where the EBITDA met and the guidance is being upped in another core play. What's the length of production mix? A) first was flowing in April, so not long but not a flush IP either. Nobody talking about the Piceance Niobrara but the firm itself but 1.4 Bcfe in 6 months is a monster well in this area. ZComment: Estimates just about have to go up for 2H13 now, given the Bakken, given the SJB and given the Piceance, partially offset by slower Marcellus ytd. Q) Higher spud count in the Bakken in the budget? OT-SFM-up 110% from its IPO today, delayed opening on IPO to 11:40-reminds me of the dot.com days but farm fresh food retail?? Thanks Zorg for the retweets! We have SWN and KOG after the bell. We own good sized positions in both names, SWN is our largest gassy name and 4th largest positon in the portfolio, KOG is around 11th or 12th and we've got calls on both going into their reports. Much more of this pre report jubilation this afternoon and those calls come off. Expectations for KOG have been beat to death, for SWN I expect an update on the Brown Dense latest vertical but not the horizontal and no project sanction. I think at worst they reiterate guidance and at best they inch up the mid point by a percent so call it 13% YoY. Marcellus to get more than its usual share of attention on the call as Fayetteville flattens. OAS call premiums have been above average all week. Z, thoughts on taking a position in a name focused on the hot zone in the Permian? I liked West's and Wildcatter01's comments adding color to the story. re 80 – Please see recent LPI and FANG updates using the pull down menu. We hold ROSE now, we don't hold the other two but find them both interesting, including FANG despite the run. SSN up 30%, it's a good bet they have another asset sale on the way and the news is leaky. adding to 81 – oh, and we own a little of the AZZEF play West mentioned though that's a pure arb spec. SSN, Might be a good time to "sell the rumor" since they have not shown the ability to do much right from an operational standpoint . re 86 – I'm not disagreeing with you on that point. Following the good economic data from ISM and global PMI improvements, the transports (IYT) have moved to all time highs. This is good news for the economy. Perhaps the expected crude oil sell-off will not be so steep, and certainly not so immediate. #78 Zorg, if we see KOG break and hold above$10, is there any resistance at and above $10.50? re 87 – I know you didn't ask me but since I do the modeling on the name I'd say coin toss. I think the numbers will be fine there for the quarter and certainly not expecting anything but a reiteration of guidance (they announce next week) with about an even chance of them yet again bringing up the low end of the guidance range for the full year. Could also see them yet again cut their average well cost for the year (now at $8mm) and you could see them comment on more locations from the TFS. I'm mulling doing somewhat higher strike September call writting in a number of names at the end of the next week … at that point 2Q13 reporting will be largely over, everyone will know everything and oil shouold again be thinking about dipping back towards $100. Good to see Bakken leadership in CLR, OAS, KOG having an impact on TPLM in terms of stock moves. Getting on a call, back in a few. Z, Thanks for your take on OAS–of course, I should've directed that question to you as well. I like your plan for next week's call writing. I love where all these O & G co.s are, but I also like to generate some monthly income since they don't for the most part pay divs. #90 Re KOG There is some supply left over from 2012 but as you can see from the profile serious supply has been negotiated already…The story is quite different from when it broke 10 last time. Lot's of folks shook out. Transcanada is moving foward with its 1.1 mmb/d Energy East pipeline wihich will move Western Canada crude to East coast refneries and export markets. At the same time, Transcanada announced building a $300m export terminal in New Brunswick. This becomes a much bigger deal if Keystone XL doesn't get built and it may be the easiest path to export landlocked Canadian crude. 87 Katherine – I have had a covered call position for about 3 months. (Aug 45). I am mostly wacky with my covered calls. If it gets to 45, I usually sell 20% of the position and move up the calls to $50. If stock pulls back I would reenter. If it doesn't, I will gradually feed into strength. As to whether they get there in two weeks will be all about the earnings & guidance. Good Luck. If your cost is low enough (Thanks Z) all your choices should be pleasant. Thanks TD. It is low (thanks Z) but I hate to pay the IRS more than my fair share. I try to keep my core position from being called away and I usually sell puts and calls around each of my positions (that have liquid options) usually a 2-3 x/month to generate income. I sell the puts where I wouldn't mind owning the shares. re 95 – Katherine, not my intent to sound scolding, just wanted to throw my tired two cents in on it. Anyone know of kid friendly venues near the Galleria in Houston, preferably something with an outdoor beergarden/junglegym? Going there this weekend with intern #1 to see a pro game. Thx. re 97 – thank you, had not seen. Regulator says XOM pipeline rupture in AR caused by 70 year old manufacturing defect. Tree huggers should rejoice in new pipelines where those kinds of issues are less likely. VLO trying to make a move off the 200 day SMA. We still don't own the name, just long a few calls in the ZMT. 99 Katherine. It sounds like you should stay with stangles & naked puts. If that case you should call on Zorg. The best directions for short term traders. The only guidance I would offer if you do naked puts or calls for income is do NOT be afraid to take losses. BCEI make a rare appearance over $42 earnings next Thursday. What is wrong w/ NOG ? Can't catch a bid even w/ oil up $1 and market at all time highs ? Geez …. re 108 – Somebody else field that. 9) not perceived as a takeout candidate at the moment. I hold them for the long term .. their acreage position is in good parts of the Williston. At some point someone will want them. As I've said before, I don't know when that will be but would guess the stock will move better as the grow comes back. Last quarter they tied in very few wells due to road restrictions. Grow resumes as they get back into completion mode. NOG – PackMan 108. My guess is that all the other BB's have many short term catalysts that NOG does not. They are a 3rd and 4th Q story and the non-op model is viewed as unpredictable. M Reger has a few things to learn about how to manage Wall St expectations. So cheapness is not a valuable as momentum in a good market. Z any different slant? You couldn't resist? Just copy response and put in a file to paste again later. One day the value will be recognized. Until then it's an opportunity. re 112 – no, that's about it. Listen, we own 30 names. We are at our all time highs today. This gives me patience with names like NOG. Not endless patience but their EBITDA / BOE is right up there with the best of the operators. Their account is not tricky and there never were any holes in it. I've never felt deceived by them. But if I am frustrated over time by a name to the point that some seem to be it might be that I need to re-examine my expectations for stock performance vs what they have going on and sell the name if it becomes a nuisance to me. NOG is at the bottom end of the ZLT Top 10, at near a 5% position (it was 8th and I have not run the numbers in a couple of weeks but it's been outpaced by some names that were below the top 10 in terms of dollars), and it is far below in terms of importance of an OAS, BCEI, TPLM, SWN, (where the positions are all 10%+ etc. If it were number one … well, it wouldn't be since I've said before I own it only after owning the leadership Bakken players (well, most of them, not WLL at the moment). Anyway, just my two thoughts but other than some mild drift up with the rest of the names I would not expect much until they approach the 3Q report. re 113 – I don't mean to be flip but apparently I'm not a good communicator on this one. If I didn't think it would ultimately work higher (within in the next 2 years) then I'd sell it. As soon as they do some MLP that loves gobbling up non-operators will take them out and that would be ashame. OT: I received a notice that the borrow rate on the STSI that I have loaned out was increased to 9.5%. So the shorts must be getting more aggressive as the price goes up. 9.5% is not huge but free money falling out of the sky for a stock I would hold anyway is fine with me. Thanks to BOP for making me aware this gift was available. Dakota's Bakken field that is now shipped east by rail. Zorg – how about BCEI? NOG just released their CC date & time. .
#119 EOX another one with nothing but air above. Classic. You could smell it today. Bankers ran it up today in order to price it. Remember the registration became effective Monday and it appears that you get your ATM Financing tonight. Artitfical ears in 3D, so get yourself a 'little ear-full' if they crunch it on the offering. They preannounced production but Street was still 950 BOEpd high for their estimates … go figure … so Revenue, EBITDA, EPS all below Street. Not a big deal in my view, since we already knew about the volumes, would be nice if analysts would actually update their models but whatever. All 12 wells in the Polar cubed space test are on line; average IP 2,549 BOEpd, don't have 30 days in these yet but these are Williams county wells, and they are half Bakken / half Three Forks. Saying it's early but they are encouraged they didn't see much communication between the zones. That will need some clarification on the call. Margins were strong in the quarter at $62.05 on an EBITDA per BOE basis. No kidding watch: Headline "U.S. natgas price fall may prompt utilities to switch from coal"